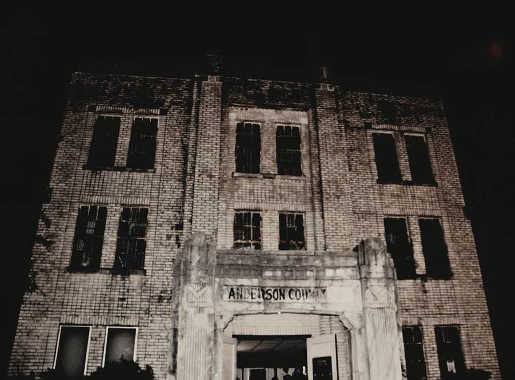 Come and join a ghost hunt overnight at the infamous Anderson County Jail, Palestine TX. It’s reputed to be haunted by a number of spirits, and poltergeist activity! The night begins with an introduction to ghost hunting and the location, then you’ll split off into more intimate groups carrying out vigils using the equipment which we can provide, together with the members of the team. If you want to bring your own equipment you can do that too! You’ll be using a variety of the most advanced paranormal equipment available, as well as tried and trusted traditional techniques. If you don’t want to continue the hunt until the morning, you can retire and try to drift off in one of the jail’s haunted cells! Tickets are limited so hurry and book now to avoid disappointment! Overnight ghost hunt with experienced paranormal investigators in a historic haunted jail in Palestine TX. This “Texas Jail House” is home to the ghosts of the guilty (And, possibly innocent!). Having been a jail on the site since 1879, when a gallows was in operation, there have been many reported deaths here. The type of people locked up here and the tragic ends they met combine to build up a lot of negative energy. Staff and visitors regularly report the sounds of whispering, doors banging, and knocking coming from empty areas of the building. In one particular instance, a member of staff was putting out Christmas decorations and had some on laid out across the floor, when something began walking across them! People have reported seeing figures moving in the corner of their eyes, and even full bodied apparitions!! The first day the owners moved into the building in the living area in one of the bedrooms they felt as though someone was sitting on the end of the bed. Volunteers working in the building have reported their hair being pulled by unseen hands, and the feeling of being touched, and their glasses knocked off their face in one instance! Past investigations have revealed very clear EVP’s, photos showing the same apparition on multiple occasions, in the same room! The Historic Anderson County Jail (AKA: Texas Jail House) was built in 1931 at 704 Ave A, Palestine, Texas. It replaced the aging 1800’s jail built at this same location. This more “modern” facility was operational until approximately 1988 when the current county jail was constructed less than a mile away on Lacy Street. After needed renovations, the building was used for juvenile detention until closing in 1996. In 1998, the building was added to the National Register of Historic Places. The rather strange triangular shaped lot on which this jail sits was a full block in the mid-1800’s. Over the past 179 years, it has seen death come in many ways. Examples include, men, having a classic western shoot-out, hangings and those contained behind steel bars to pay retribution for their crimes. The earliest known structure here was the log home of Mrs. Ann White, a widow who looked after the children of widowed Dr. E.J. DeBard. Later, it was the home of Jasper Starr, an early Palestine newspaper editor. With the rapid growth of Palestine in the 1870’s, a new jail became necessary. In 1880, the Second Anderson County Jail was constructed. In 1931, the Third Historic Anderson County Jail remained at 704 Ave A and was built on-top of the previous Jail’s foundation. This three-story art deco building stands on a site that housed criminals for 135 years.